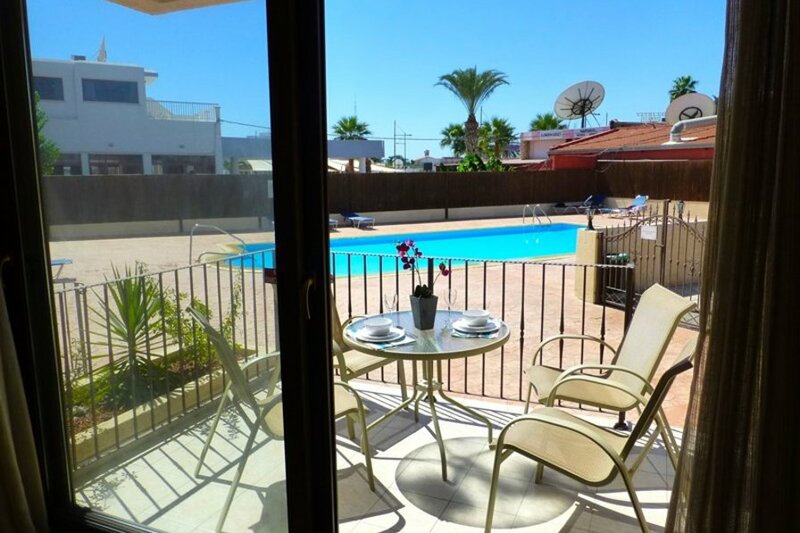 Lovely 1 bedroom ground floor apartment close to the beach & bars/restaurants of Ayia Napa. Set in a quiet area with an onsite restaurant & shop. The beach is a 5 mi walk. This complex is in a central location just 2mins from the bars/restaurants of Ayia Napa. There is a restaurant & shop on site so a car is not required. The harbor & beach is a 5 minute walk. The apartment has one bedroom & sleeps 2 people. There is a large sunny living room with a fully equipped kitchen. To the front of the apartment there is a south facing veranda with a table, chairs & parasol so you can enjoy the al fresco lifestyle. The communal pool is well maintained & quiet. Ayia Napa has something for everyone. It has some fantastic bars & restaurants as well as a vibrant nightlife. The luna park is just a 5 min walk from the apartment where you will find numerous rides to entertain all ages ranges. At the harbour you will find some fantastic fish restaurants, boat trips & bars. The main square of Ayia Napa is a 5 min walk from the apartment. There are many excursions you can take to enjoy the most of Cyprus. Eman tours have an office across the road from the apartment were you can book all your trips/tours.